Fill and seal from the same position. Fill, seal and palletize from the same position. Fill, seal and palletize from the same position with case former. 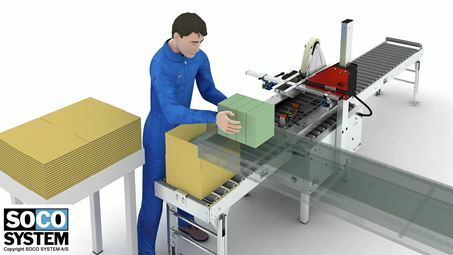 Fill, seal and palletize from the same position with automatic case former. 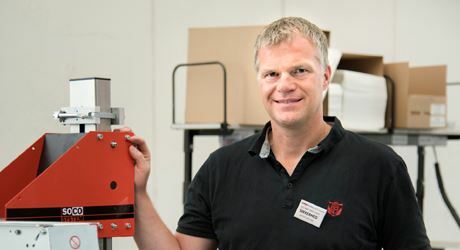 Coop.dk - one of the largest webshops in DK - boosts capacity with new packaging systems from SOCO SYSTEM. When sealing many boxes every day using a handheld tape dispenser, inevitably shoulder pain will develop. Using automated carton sealers for top and bottom sealing of cases, this can be avoided. It is also faster, and the end result much more impressive. Coop.dk uses 11 different box sizes due to the large variety of products and order sizes. The carton sealers automatically adjust to the selected carton size making them ideal for web shops typically working with many different box sizes. 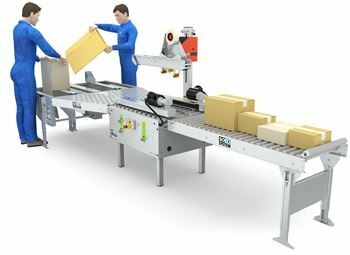 The packaging line consists of three 2-person packaging stations complete with packaging tables to facilitate case erecting, closure of the bottom flaps, and fixing of the case during filling. Ball tables enable easy insertion of filled cases into the case sealer, which automatically adapts to the size of the box and seals it at top and bottom with tape. The sealed case is then led onto a driven roller conveyor, after which the cases from the three packaging stations are accumulated and collected for palletising. The packaging line consists of standard modules from the extensive SOCO SYSTEM range; they can be expanded, moved, and adjusted in response to changes in the production environment. The SOCO SYSTEM products are ideal for web shops and are stocked to meet different packaging needs and solutions. Read more and see the video about the packaging line at COOP! From manual packing to mobile, semiautomatic packaging lines. When a printing house like Kailow suddenly receives a large order for printing of a magazine, quite a lot of paper will have to get through the flow quickly. This was the background for the investment in 2 mobile boomerang packaging lines from SOCO SYSTEM. The packaging lines are placed in the bookbinding department ensuring efficiency improvement and minimising manual lifts. The packaging line covers the entire logistics from printed matters to closed cartons - ready for palletising. The core of the packaging lines is a semiautomatic case sealer for simultaneous top and bottom tape sealing. This feature is particularly interesting for Kailow as they cannot use cartons with automatic bottom due to the weight of the contents. This means that Kailow saves 2 manual handling processes for each carton (bottom and top tape sealing) when using the case sealer from SOCO SYSTEM. Furthermore, this ensures packaging savings as cartons with automatic bottom are significantly more expensive than regular folding cartons. 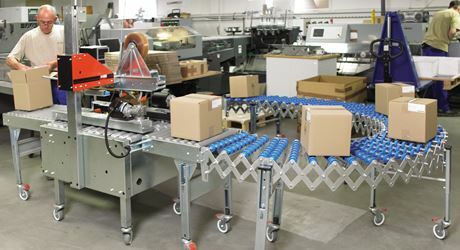 After the case sealer, the cartons are accumulated on a flexi conveyor system. The conveyor system is designed as an adjustable boomerang requiring a minimum of space. The boomerang brings the carton back to the operator, thus minimising the number of steps. Finally, the packaging line is equipped with castors for easy relocation in the production. Three efficient SOCO SYSTEM standard modules combined to an effective, ergonomic and compact one man packaging system. All modules are part of the SOCO SYSTEM and the kit can be extended to a fully automatic packaging line. Fill and seal from same position. Four efficient SOCO SYSTEM standard modules combined to an effective, ergonomic and compact two man packaging system. See the pack table F-100 in action! See the case sealer T-55 for random case sizes in action! Read more about the solution! After 40 years still going strong and with a stability which is fully abreast of present time equipment. Improved productivity, neater and better case sealing, plus the ability to relocate, adapt and extend the packing station. These are some of the benefits of investing in a flexible SOCO SYSTEM packaging system. Investment in a new packaging line gave an improved working environment, higher productivity, and lower transport costs. General information: SOCO SYSTEM Inc.